A perk of my profession, is that we get to enter worlds that we would normally have to buy a ticket to see. We get the whole experience from the inside. We become members of the tribe for a day. A Theater Company, specializing in one-ring circus production, based on the focused energy of modern and traditional circus arts. 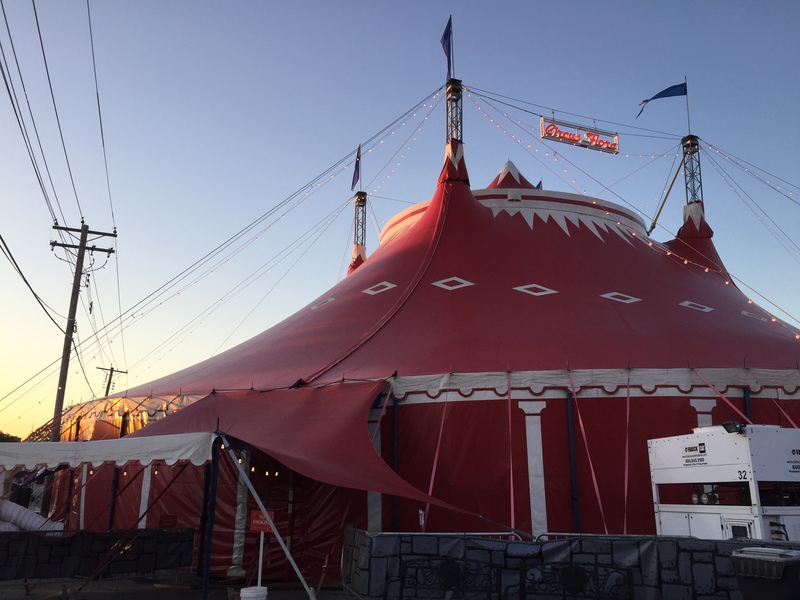 They create a truly American circus, with a narrative that engages audience members personally and emotionally, and physical feats that are inspirational. I have wanted to shoot w/ a “real” circus setting for sometime. Circus Flora is a one-ring circus based in St. Louis, MO, that fuses the energy of “modern and traditional circus arts”. Their traditional style was what I wanted to play with and explore. A true procrastinator, I waited till the circus was already performing before I tried to put together my project. On a whim, a friend of mine’s wife worked for Circus Flora and was able to connect me with powers that be. I really didn’t have a full plan. I just knew that I wanted to cross fashion w/ circus. With expectations of being allowed to maybe walk the set with a model and small crew, I presented my request. What I received knocked me over. Not only would we be allowed in, but if we chose to enter on their off day, they would ask several performers if they would participate. Are ya kidding me? The day of the shoot was a miraculous sunny and cool day in June. Just a day before it had been 97°, humid and hazy. This was a freak of nature, literally. ﻿We had power sources to use on site, but just the same we used a combination of electric and battery powered lights. I used mix of my Broncolor Move 1200 kit (w/ two heads), Broncolor Para 220, 7’ Photoflex Octodome and an Elinchrom Rotalux Softbox Octa 53” (that I had modified to fit a Broncolor pack). The wind picked up around 9am and tossed the Para around. We striked it before any damage could occur. Because of the plentiful sunlight, we got away with the Elinchrom for most of the fill light and the Octodome as an edge or back light. Each model and performer were scheduled for two hour windows. As we shot through one scenario, the next group was in h&m.